Midnighters launched it in 1960 but Chubby Checker must be given the credit for making it famous. He did so, so successful, that he topped the American chart twice with it, the only song to do so. Many have cashed in – Sam Cooke Twisted the Night Away, Petula Clark did the Ya Ya Twist, the Isley Brothers, Beatles and Brian Poole and the Tremeloes advised us to Twist and Shout, Frankie Vaughan warned us, Don’t Stop – Twist and both Danny Peppermint and the Jumping Jacks and Joey Dee & the Starliters recorded two entirely different songs called the Peppermint Twist. Even Frank Sinatra, who hated Rock ‘n’ Roll, got in on the act in 1962 noticing that Everybody’s Twisting. 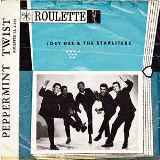 This week we look at Joey Dee & The Starliters’ Peppermint Twist. Joey, whose real name was Joseph DiNicola, was born in Passiac, New Jersey in 1940, he learned clarinet and was offered a place in the school band, two of his classmates went on to be in the Shirelles. After leaving school he signed with Scepter records where he recorded four songs one of which included the Shirelles on backing vocals. They began playing small parties and proms and then progressed to weddings and corporate functions. One night they were performing at a club called Oliveri’s when an agent spotted them and offered them a residency at the Peppermint Lounge in New York. Many famous people regularly attended the club, “I can recall a few,” Joey remembered, “Shirley McLaine, John Wayne, Nat King Cole, Judy Garland, Zsa Zsa Gabor, the Duke and Duchess of Bedford from England as well as many notable people who were columnists and people in the media.” The club was regularly featured in the press and thus Joey was offered deals from various record companies. If ever there was an instance of someone being the ‘right man for the job’, then that man would have to be Henry Glover. A musician, an arranger and a record producer, he could boast a career that stemmed back to the late forties when R&B was just getting started. Whilst at King Records he produced the original version of The Twist by Hank Ballard, and he A&R-ed countless recordings by the Bill Doggett Combo. He and Joey wrote The Peppermint Twist which Roulette records liked and promised to get it recorded and released to cash in on the twist craze before it died, so Joey signed with them. For the recording Henry brought in Billy Butler from the Doggett combo to play guitar and Thomas ‘Beans’ Bowles to play baritone sax. In 1964 Joey opened his own nightclub in New York called The Starliter, he only had it for a year before deciding to sell it and go back on the road, this time with a new guitarist, the, yet-to-be famous, Jimi Hendrix. Joey’s son, Joey Jr is involved in a writing aspect only but does record with his brother, Ronnie in his group Ronnie Dee Nation. More recently Ronnie plays saxophone for his dad. Joey still performs to this day sometimes with David Brigati and sometimes with Frankie Valli’s brother Bob. In September 2010 at the junction of Washington Place and Columbia Ave in Joey’s hometown of Passiac, New Jersey, a plaque was placed on that corner which was dedicated to the band.